The ocean front vacation guesthouse, located on the edge of a remote Caribbean beach, is designed to rejuvenate and immerse extended family and friends into the moment and with no distractions. 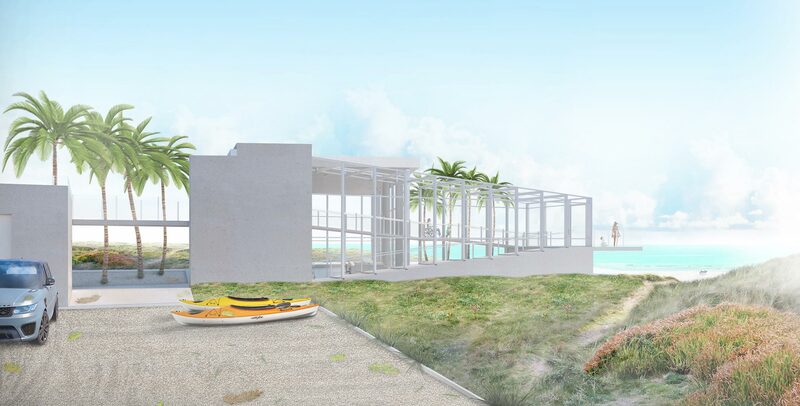 The minimalist 3,800 SF residence transparently sits, within the remote environment, on a landscaped platform formed by a walled entry courtyard on the landward side and a palm tree terrace on the ocean side. Indoor and outdoor spaces are integrated with elements of the structure which expand to form experiential movement through the spaces. The defining feature is a glass enclosed ramp which rises from the ground floor and projects toward the ocean, returning at a mid-level observation platform to continue upward to the mezzanine. The steel grate ramp provides a gradual ascension toward the ocean view while allowing wheelchair accessibility for the Owner. Integrated storage elements provide enclosure for private spaces and keep personal objects out of site. An open upper level, intended to accommodate guests with movable and hanging lounging platforms, has views of both sides of the island and overlooks the large 2 story forum space.